A tribute to my grandad, Tom Smith, a magnificent cyclist who died on 27th June 2017 at the grand old age of 94. You never got to see the workshop I created, Oxford was a little bit far for you to travel to by the time Broken Spoke was born. But this place, where people come to fix bikes, learn to ride, and connect over cycling, this place to which I have dedicated the last 5 years of my life, has so much of you in it. Women mechanics are rare, we tend not to develop the skills growing up, and learning anything new as an adult is hard work. Community workshops, which put tools back in the hands of the people, are still rarer. So from time to time I’ve been asked the question – how did you get into this? I wonder if you knew how much you were the answer to that question. You knew as well as anyone that cycling permeated the culture of our family. The way that some families are obsessed with football clubs or music, for us it was cycling. I grew up watching all you grown-ups doing it – to get to work, to get around town, to go on day trips and holidays. Not all families are like that, and I always felt lucky for it because we were never taught to fear cycling around London and that was liberating. We learnt that our legs were powerful enough to carry us just about anywhere from hearing about your CTC adventures, and dad, John and Paul’s [my uncles] trips to Suffolk or across France. And I’ve always tried to share this ‘magical power’ of being free to roam and seeing the world from two wheels with my friends. You see cycling is infectious, when people get into it, it doesn’t become a passion so much as a way of life – the way of the cyclist. But it usually takes a pioneer to introduce it and grandad I think you were the cycling pioneer of the Smith family. 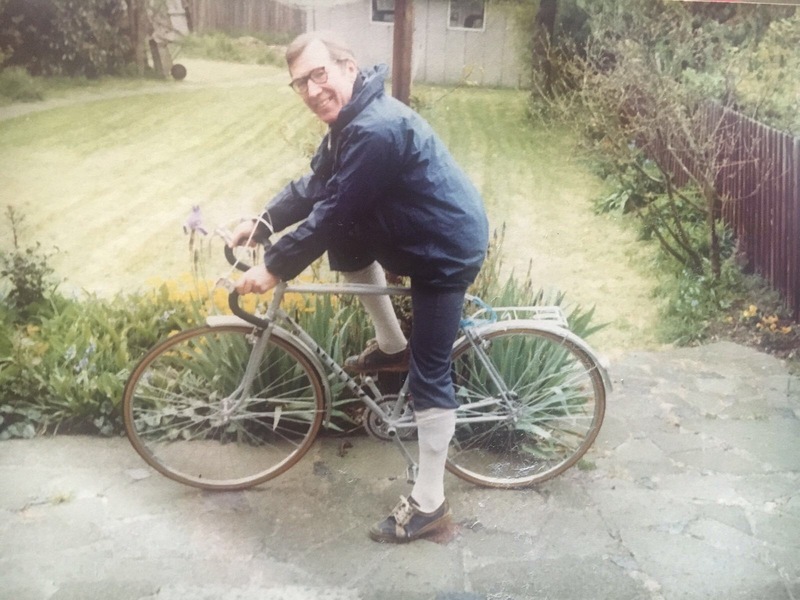 For all of my life I’ve identified you as – grandad Tom, the cyclist – but you actually only really got into it in a big way when a series of tube strikes in the 80s disrupted your daily commute. Ever the pragmatist – this was true to form for you. Soon cycling became not just a commuting routine (I know how you LOVED a routine) but also a leisure pursuit. You joined the Essex over-forties cycling club and started setting off on club runs around the county, and when you retired there was no stopping you. Dad always says you gave up work and took up cycling. It’s a sign of how important the club was to you that the certificate, which you received when you turned 80 for continuous membership since 1994, still hangs on your bedroom wall. But it was as much your approach to cycling as your general enthusiasm for it which I loved. You had the mind of an engineer and grew up in an era when owning a machine meant actively maintaining it. You took pleasure in repairing, maintaining and even building bikes. To you that was the natural thing to do. Growing up I don’t think I ever saw a car in your garage, just tyres hanging from the ceiling, tools on the shelves and two or three of your bikes leant up against the wall. You were a practical man, you rode steel touring bikes – they could go the distance, carry luggage and they would last. I followed in your footstep with a steel Dawes Horizon when I started touring at about age 20. Grandad you had such an interesting life, growing up in the east end of London, running special ops behind enemy lines in the war, marrying my wonderful grandma, having 6 kids, up-teen grandchildren, moving to South Africa… and then back. I’m interested in all these things but we only ever really talked about cycling. I could always connect with you about cycling. You could recite the gear ratios you installed for the different decades of your life (getting ever lower) and, though I can’t remember them now, as I learnt more about mechanics the numbers actually meant something to me. I grew to love our technical conversations – almost like a secret language we could share. I took from you the idea that it is both the responsibility and joy of the rider to get to know and take care of the bicycle as a machine. We shared a love of navigating using paper maps. I think for you bike rides were about really getting to know places and map reading was part of that. Your bike tours might seem quite ordinary to some, the English coast, Essex, the French countryside – hardly exotic. But for you places did not need to be far away to be worthy of interest and exploration, and you kept a record of every trip. Basically, I liked your old fashioned cycle tourist ways and I think you liked that I’d taken your hobby and run with it. Cycling helped you connect not only with me but with my aunts and uncles who would sometimes join you on your club rides or trips; and my cousins, some of whom have inherited your bikes to begin their own cycling journeys. I believe that going cycling together creates a unique space between people, sharing the experience enables us to connect with each other – maybe cycling together is part of why we are a family of such strong bonds. This weekend, I rode 115 miles over night from London to Dunwich with my little sister, my cousin Joe and my dad – a cycling adventure shared across the generations of our family. Grandad, I want to say thank you for being the practical, tenacious and single-minded man you were. I think these traits helped you become a magnificent cyclist and make cycling such an institution in our family – one which has shaped and enriched my life. I am so proud of your long and active life, I tell people about you all the time. Your exploits on the bike are the stuff of family legend. I will always remember when you said to me, aged 80 and sometime after the second hip replacement, ‘the bottom bracket on my Dawes is on its way out but I’m not sure if I’ll change it because how much longer will I be cycling, really?’ We agreed that you should out of respect to the bike – and you didn’t stop riding till you were 91! Your legacy will roll on. With love and respect from your granddaughter.